The story of the Pineapple Sherbet Punch Recipe. Once upon a time a married couple and long-time guests at the restaurant asked the restaurant to cater their 25th wedding anniversary dinner. One of their requests was to have a variety of appetizers and several "self-serve" punch bowls set up on the patio before dinner. They also asked if they could bring the glassware. Seems serving the beverages in what basically looked like glass jars meant meant something to them (pictured above). I asked them what two or three of their favorite fruit flavors were. They both agreed pineapple was one of their favorites. 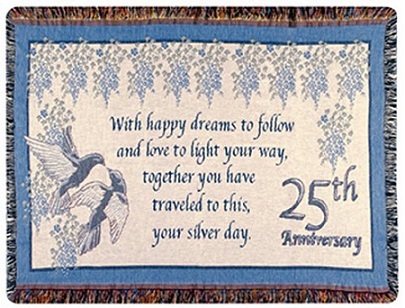 Ah, yes ...25 years of bliss. This is the restaurant drink recipe we came up with. They, and the anniversary party, were very pleased. Preparation time: 10 minutes. Serves 20"ish"
Now someone asked me how to keep the punch cold without ice cubes (which would dilute the restaurant drink recipe). Here is a good tip. After making the first punch bowl (minus the 7-UP, scoop out some of the mixture into several containers (ice trays?) and freeze ahead of serving time. As the punch bowl needs to be refilled, add the frozen version and some more 7-UP. 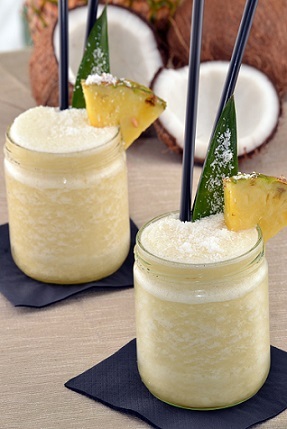 Enjoy the pineapple punch recipe and all the restaurant recipes on the website and the company of those you share them with! Did you know? Sherbet and sorbet are different products. For Americans, sherbet is typically a fruity flavored frozen dairy product with a butterfat content between 1% and 2%. Sorbet is considered by Americans to be a fruity frozen product with no dairy content, similar to Italian ice.